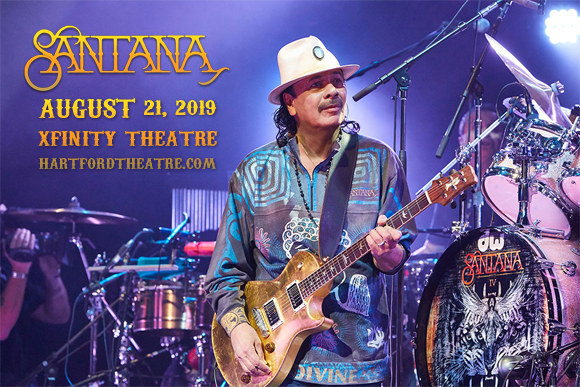 World-famous Latin rock veterans Santana are coming to Xfinity Theatre on Wednesday 21st August 2019 on the Supernatural Now Tour! The multi-platinum-selling Grammy Award winners are celebrating 50 years since their seminal performance at Woodstock and 20 years since the release of Supernatural, so fans can expect an unforgettable show from these incredible performers! Not only that, but iconic rock act The Doobie Brothers are performing in support! Formed in 1967 in San Francisco, California, Santana is a Latin rock band, led by Mexican-American guitarist Carlos Santana. Finding fame in 1969 with a notable set at the now legendary Woodstock festival, Santana subsequently realised its self-titled debut album, which was a hit both critically and commercially, eventually gaining double-platinum certification. The group has released 17 albums certified either gold, platinum or multi-platinum throughout its 50-year career, having released 24 albums in total, with their 25th due for release this summer. The band went on a 7-year hiatus from recording in the early 1990s, and returned to the charts with Supernatural – their best-selling album to date, which peaked at number one around the world and went 15-times platinum in the US, selling over 27 million copies worldwide. The album also earned the group nine Grammy Awards and three Latin Grammy Awards and launched two Billboard Hot 100 number-one singles ("Smooth", "Maria Maria"). In 1998, the group was inducted into the Rock and Roll Hall of Fame.